Life has gotten a lot harder now that I have a full blown crawler, who pulls up on everything, and is about to cruise. (I saw him standing by himself yesterday for a second too…) Asher has already eaten half of a dead spider, (I got the other half out with my finger), and half of a clear Christmas tree light. I’ve also fished out of his mouth one of the girls rings and a carpet staple. Anybody want to take bets on how soon we will go to the E.R.? I just can’t watch him close enough with the other 2 girls running around. So, this brings me to the ‘bad timing’ part. 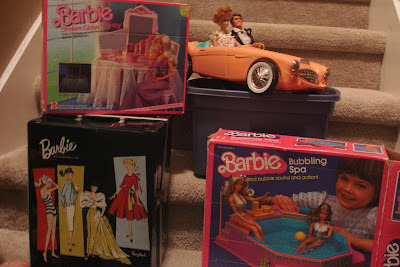 My dear mom decides that it is a good time to clean out a closet full of my old Barbie stuff at her house last week. Wonderful! If only she decided to leave it at her house. But no! She brought it all to my house. Of course, the girls LOVED it and still do and I did get a kick out of seeing my old stuff, but now not only do I have to watch Asher to make sure he doesn’t eat another spider, NOW I have to make sure he doesn’t eat any of this stuff that has been strewn throughout our house. 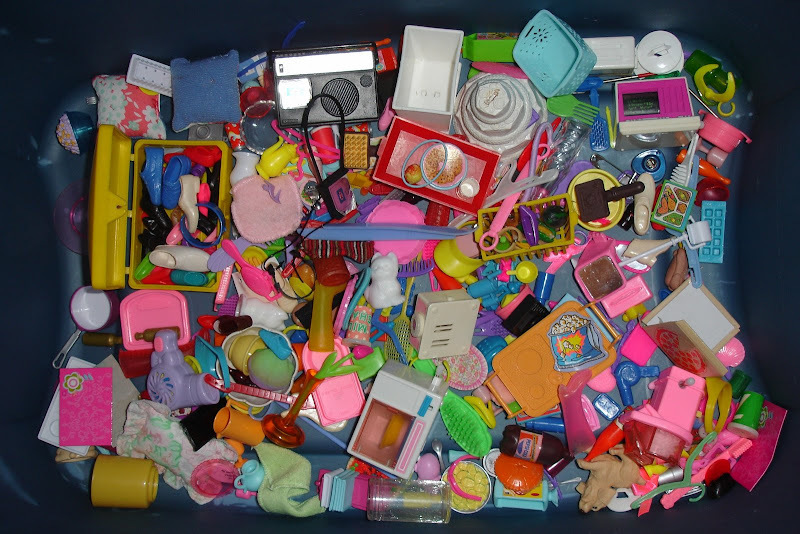 These are some of my favorite Barbie things now passed down to my daughters. (The black case and car were my mom’s when she was little!) And yes, I kept all my stuff in their original boxes, didn’t you?!? Ok, so ALL of those things brought back a lot of memories! I miss the peach car! I had so many great memories with that car! I liked it so much better than my silver Barbie car that made noise when it moved, remember it? Oh those were the days!